The range of CBRN threats posed and attacks perpetrated by nation-states and terrorists is varied and often unexpected. The technologies and other aspects of response have to be ready for anything from a small release of a CBRN agent to a full-scale mass-casualty event. Sometimes even a small release has the potential to become a mass-casualty event. Leaving the N of nuclear Armageddon to one side for the purposes of examining more likely types of attack, and how we would be expected to respond - the technologies and modus operandi used in CBR attacks pose huge challenges. There are many variables than constants in the CBR equation. From nerve agents left on door handles to aerial bombardment on whole towns, the M.O. of CBR is limited only by the perpetrator’s capabilities. While such attacks are rare, the domestic chemical incidents in 2018 exposed understandable vulnerabilities at all levels, in intelligence and pre-emption and also identifying what chemical agents were used, and who deployed them. In the civilian-based events in Salisbury, England, as with the Litvinenko radiological poisoning case in London 12 years ago, special challenges were also faced in the subsequent clean-up which accompanies any CBR incident, in both cases, in urban areas. Large-scale CBRN is almost always launched by nation-states against opposing forces and civilians in conflict zones wreak the most victims, the most notable presently being the Syrian Civil War. A century after the first use of CW as a true WMD, in World War I, a nation state - Syria, aided by Russia - is using CW to kill and injure thousands of people, and most horrendously, its own citizens. In 2018 alone, at least eight CW attacks have been documented. On the terrorist side, the biggest attack to date is the improvised sarin dispersed on the Tokyo subway in 1995, injuring hundreds, by a cult group already known to Japanese police which had tried several other forms of CBRN acquisition. Before Syria, the biggest post-war nation-state CW attack used aircraft to drop bombs and artillery shells containing mustard, nerve agent and other CWAs on Halabja and other Kurdish villages in 1988, killing 5,000 in one day. Thirty years on, the Syrians are dropping - again out of aircraft - barrel bombs loaded up with sarin and chlorine: relatively simplistic and equally brutal. In the April Douma attack, gas cylinders were reported to have been dropped on a building with the subsequent rapid release of the pressurised gas. This was also documented in surface-to-surface chlorine-filled rockets in an attack on the same town on 22 January. So far, CBR incidents have rarely involved IEDs, but in Syria and Iraq Daesh has used mustard agent - either purloined from old Iraqi stock or homemade - and chlorine in varying levels of potency in dozens of booby-trapped IEDs left in formerly occupied areas, and have used mortars and vehicle IEDs mainly against Iraqi and Peshmerga troops. In both state and terrorist attacks the aim –underpinning the M.O., and using fairly basic technology - is to terrorize troops and civilians with clouds of chlorine and mustard penetrating buildings and below-ground shelters and drive them up to exposed higher ground. Syrian soldiers are reportedly using sarin nerve agent in hand grenades to kill people sheltering in tunnels and bunkers. An emergent threat is drone-dropped devices carrying chemicals. Daesh has used drones for propaganda filming, intelligence, to attack Peshmerga and Hezbollah used hostile drones as early as 2004. The poisoning of five individuals, including one fatally, in Salisbury in March and June 2018 illustrated the force-multiplier effect of a CBR incident that, how small the sample of toxic material, it will have a protracted and costly range of effects. The attempted murder of the Skripals in many ways echoed the November 2006 assassination of Alexander Litvinenko in London. Both used rare CBR substances; both incidents were aimed at a specific individual, but caused the decontamination and temporary abandonment of several locations; and both incidents involved possible contacts with the lethal agent. In each case non-targets were contaminated. In a civilian CBR incident, first responders and policy makers usually have to rely on their experience from any previous incidents. As CBR is so rare they may have no such experience, but training may equip them for a range of scenarios. Even if only a small amount of a CBR agent is released, a combined agency response is needed to deal with the multiple problems of contamination and the tracing of contacts which comes with spread of CBR agents. Detecting and identifying the causative agent is of utmost urgency but often doesn’t conclude until others have been affected. In Salisbury, Novichok – which has no precedent in CW use - the agent was not identified at first so the incident was not treated as CBRN. The rarity of the substance - produced in just one place, in Russia, specifically to evade detection - posed a special challenge. However, having the Porton Down labs closely linked with the hospital where the victims were treated meant there were rapid testing, fully trained staff, and the appropriate equipment. This may not always be so. Even in this case first responders, ambulances and equipment were initially exposed. After Litvinenko was first hospitalised in November 2006, it was weeks before polonium-210 was identified as the material killing him. On day 22 of his illness urine analysis, using gamma-ray spectroscopy, showed a characteristic 803 keV photon emission. This raised the possibility of polonium-210 poisoning. As polonium adheres to metal, a silver disc was suspended in the body fluids taken from Litvinenko. The disc attracted alpha particles with the energy signature of the isotope polonium 210. The UK has improved PPE, detection, and emergency services training, with specialist teams in all three blue-light services (location dependent), and closer relations between the British Army. 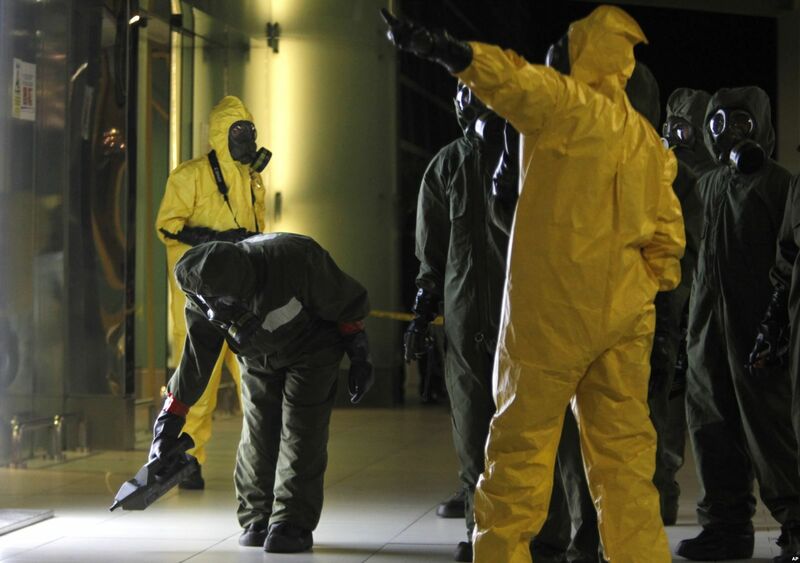 Large-scale exercises have simulated CBRN attacks to test response in mass-casualty situations. However, if a more extensive CBR attack occurs in a crowded, dynamic city like London or New York, every resource, response technology, and intuition – thinking outside the box - will have to be marshalled to deal with a potential multiplicity of M.O. involving a combination of toxic agents, and possibly using several delivery methods as well as explosive devices. Whatever the extent or apparent limit of release, any event involving nonconventional weapons will push our resources to the limit.